The digital age has shown that data is an important factor in pushing organizations to a new level. And, Big Data is beginning to see an important role in business development. Every organization should use data visualization services to collect customer and organizational data, and interpret the results effectively. Big Data and related technologies – from data warehousing to analytics and business intelligence – are now impacting every enterprise. 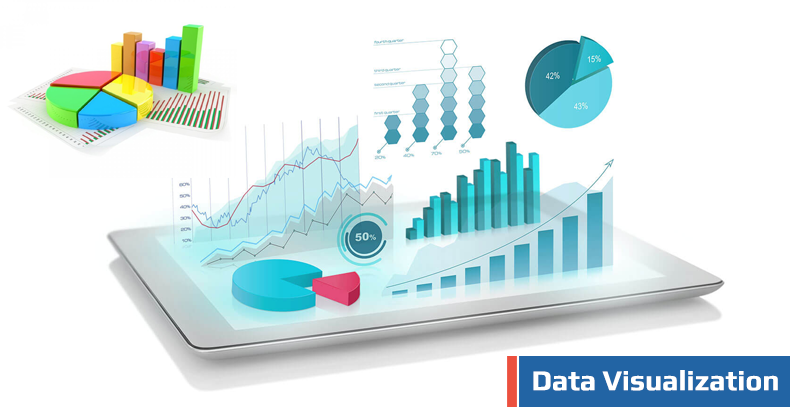 Data visualization is the process of highlighting the data insights in pictorial or graphical formats. Modern technologies have been instrumental in enabling companies to leverage data visualization. The objective of any visualization tool should be gaining crystal clear information easily. It makes way for entrepreneurs to take the right decision for their businesses. Visualizing the complex data simplifies the process of understanding the business insights. It will help you find new business opportunities by interpreting and evaluating big data. The latest software and tools have the ability to interpret huge amounts of data in a graphical manner. Data visualization has a big potential among the corporate companies to improve their business processes and increase the revenue. If you are still not employing any data visualization techniques, now is the time to start using them. Enterprises can increase their sales and revenue by using data visualization techniques. Many companies are now using data visualization applications to understand their business insights and boost their productivity and efficiency. Data visualization will help companies to analyze the processes in various departments such as product, sales and marketing. It enables the top-level management to focus on the areas of improvement to generate more revenue. It also helps the organization to become more productive. Data visualization helps to see the gray areas of your organization. It is very useful to take right decisions oriented towards business improvement. The C-suite executives can easily identify the functional processes that require attention. Putting the data in the form of charts and graphs helps to understand the business faster compared to reports. It is also equally important to find the correlation between the working conditions and enterprise performance. Data visualization will help you to find these correlations and take better decisions considering customer satisfaction and product marketing. The analytics provided by data visualization applications helps to improve your sales. It gives a better understanding of the market and enables you to develop your business strategy accordingly. The tools produce in-depth sales analysis to help you forecast sales. Your organization size does not matter; you can start using data visualization applications to understand your business better. If you are looking for the best data visualization solutions to understand and interpret your business insights, and increase business revenue, then Deevita can help you to get there. Drop a mail at sales@deevita.com or contact us at +1-425-502-5094 to know more about our data services, from data systems architecture design to data systems testing.